The post-Famine decades saw a revival in the industry in Connacht and in 1864 a flax spinning company was established in Castlebar. The acreage under the crop around the town was multiplied threefold within a year. A Mr. Hays started a flax mill in Ballina in the same decade and the industry in the town proved lucrative enough to be continued by a Mr. Dunbar. 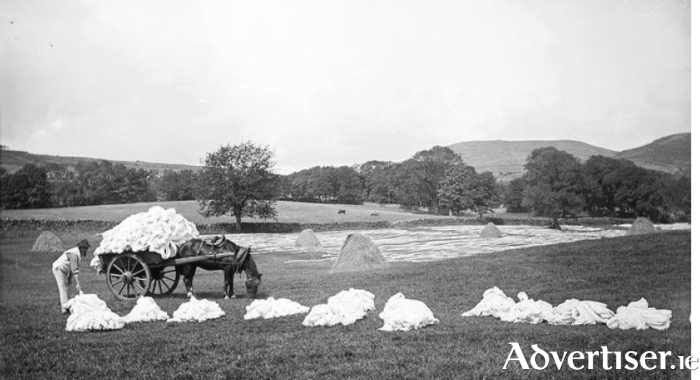 Mayo's moist soil and cool climate were particularly suited to growing flax but the rise in demand for cotton affected the demand for linen and the industry suffered. Linen promoters had to devise an alternative approach to stay competitive. In August 1900, a meeting of town traders and flax growers from the surrounding district was held in the Moy Hotel, Ballina. The conference was called to discuss the possibility of aiding local growers by establishing a scutching mill in the centre of the town. Scutching is the process that separates the woody stem from the flax fibres in preparation for spinning. Flax was already being grown around Ballina but a major impediment to gaining maximum profit was the need to transport flax from the town to scutching mills that were inconveniently located. A mill in Ardnaree had closed and so the closest mill was Mr. Perkin’s (who was considered expensive ) or Mr. Fausette’s in Ballycastle, 30 kilometres away. The meeting was in agreement that any new mill in the town was not to interfere with the business of existing mills, quite the opposite. By encouraging flax growth, the meeting hoped to create more business for existing mills. The new mill in Ballina would be primarily for the benefit of the small tenant farmer, though the meeting was held on a fair day and so many small farmers were not in attendance. Because the district was rather poor, it was decided to fund the venture using the co-operative approach supported by Horace Plunkett. Mr. Plunkett had sent a representative to the meeting to explain the buying of shares in the community based mill. Experienced contributors to the meeting believed anything less than a total commitment to 400 shares at £1 each would be insufficient. The Board of Agriculture supported the mill proposal and was prepared to rent land in the parish of Moygownagh for the purpose of growing flax as an experiment to teach farmers the most practical methods. The local urban and rural councils also pledged their support and it appeared as if the mill would be operational before the end of the year. In late January 1901, a society was formed to push the mill proposal as interest was not forthcoming. Only 62 shares had been committed to by that date. That number had risen to 120 shares the following month, well short of the necessary 400 share target. Support may have suffered through the dissemination of rumours from mill opponents that flammable flax stored in a central location in Ballina was an inferno waiting to happen. The society was aware of the rumours and countered that only 8-10 acres of flax would be stored at the mill site at any time. References to the Ballina mill proposal stop at this stage. The scutching business was not in decline as the Ballycastle mill continued to report exceptional production levels throughout 1901. At a flax show in Ballina in 1902, the winners of the scutching exhibitions came from either Fausette’s or Perkin’s mills and by 1910, only Fausette’s mill was operating.